Not available. Production has been discontinued since 2007 because new European ROHS rules outlawing certain substances in all electronic parts and products sold in the EU caused many parts manufacturers to discontinue critical parts used in the Lyra Connoisseur preamplifiers. Even though the ROHS laws only concern the EU, the worldwide discontinuation of critical parts, which were never replaced by ROHS-approved equivalents, caused that LYRA was forced to stop production of the Lyra Connoisseur preamplifiers alltogether. Full service & support available. Also, on a case by case basis we are able to upgrade older 4-series versions to 4-2 SE level. Lyra is one of the world's premium phono cartridge manufacturers, and the 4-2P SE is the ultimate companion "cost-no-object" phono preamplifier. 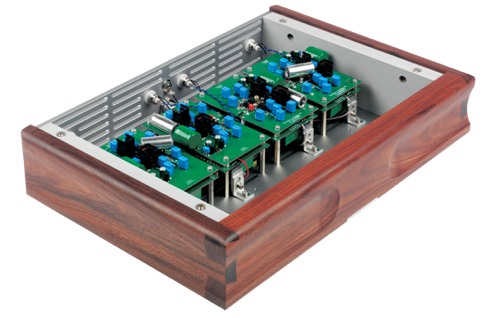 Like the matching line preamplifier, the 4-2P SE is an extremely complex and intricate construction based around four separate amplifier modules of two amp stages per channel, with all critical nodes built as "air dielectric". In total there are 48 separate regulators with discrete components only. The extremely accurate RIAA circuit is part active, and part passive. Each approach has benefits and drawbacks. By combining the two we have retained the best features of each, and avoided the drawbacks. The amplifier circuits have JFET inputs, in a differential unbalanced configuration. It uses folded-cascodes subsequent to the JFET inputs and active current sources are used throughout. There is no VAS stage per se, this being replaced by the folded-cascodes which work into a current mirror. The output stage is a JFET/bipolar hybrid augmented by MOSFETs, which operates in class A. The 4-2SE is DC-coupled throughout, with no coupling capacitors. Control over DC offsets is provided by a DC servo circuit, although a lot of work has been done to make sure that the servo does not adversely affect the sonic performance.